VILLAS AND APARTMENTS TO RENT IN LAKE VINUELA, SPAIN. 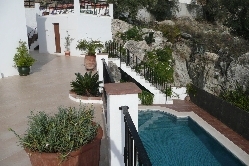 Welcome to our selection of holiday homes to rent in Lake Vinuela, Spain. Lake Vinuela is named after the small Andalucian white village of Vinuela. In recent years, Lake Vinuela has become a popular tourist spot for those who wish to get away from it all. The town of La Vinuela hosts several festivals each year as well as traditional and contemporary entertainment for visitors. The landscape is some of the most beautiful in Andalucia and is covered in olive and cereal plantations. There is much to see for nature lovers and activities are close by for those who would prefer outdoor activities. Looking for self catering holiday accommodation in Lake Vinuela? Then below is a selection of holiday apartments in Lake Vinuela and holiday villas in Lake Vinuela that can be rented direct from their owners. You can either click on each listing for further details or you can use our search engine on the left if you are looking for something in particular. The lake is only 5 minutes away so why not have a fish. However, a fishing licence is needed but they are easy to obtain. Why not go for a walk around the local area and see the scenery or even go on a hike? There are lots of hills and highland in the area. There is horse riding available for all ages and lessons may be taken for anyone over the age of 10 years old. Why not go for an exciting ride through the countryside. Lake Vinuela is specifically named after the small white village of Vinuela. This is a more popular location to visit for those who are looking to get away from it all as it has a quiet and peaceful community. Every year there are a number of festivals that take place. The surrounding area has some of the most beautiful views in Andalucia. Click on the buttons to read the reviews.